We highly recommend the following titles and usually have them in stock. Call us at (510) 548-3402 to verify availability and ask about other titles we may have. 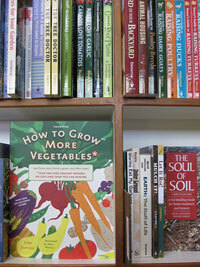 Ecology Center members get 20% off all non-sale books. Golden Gate Gardening by Pam Peirce. An indispensible guide to food gardening in the Bay Area. Vegetable Gardener’s Guide to Permaculture by Christopher Shein. An introduction to permaculture for those interested in creating a productive edible garden. Art of Fermintation by Sandor Ellix Katz. How to ferment yogurt, kimchi, kombucha, and other live-culture foods. The Water-Wise Home by Laura Allen. How to conserve, capture, and reuse water in your home and landscape. Urban Homesteading by Rachel Kaplan. A gorgeously illustrated handbook on DIY and sustainable living in urban neighborhoods. Create an Oasis with Greywater by Art Ludwig. The standard book on building and using greywater systems in the landscape. Bay Area Forager by Mia Ander and Kevin Feinstein. A handy guide for finding and identifying common and wild edible plants in the Bay Area. Worms Eat My Garbage by Mary Appelhof. The classic book on composting kitchen waste with worms. Afro-Vegan by Bryant Terry. Farm-fresh African, Caribbean, and Southern flavors remixed by a local chef. Eating the Alphabet by Lois Ehlert. A fun, bright and yummy look at food and letters for the youngest of readers and eaters. Mollie Katzen’s Recipes: Soups by Mollie Katzen. Classic soup recipes in a convenient easel format. A is for Activist by Innosanto Nagara. Radical alphabet board book for children and adults by a local artist and activist.